After the Ancients destroyed themselves in the Sixty Minute War, there were several thousand years when Nothing Much Happened. These were the Black Centuries. Mankind was reduced to a few thousand individuals; scattered bands of savages who hid in cellars and caverns to escape the plague-winds and the poisoned rain, and survived on the canned goods they managed to dig up from the ruins of their ancestors' great cities. It was a savage age, when life was cheap, and most people would happily have sold their own children for a tin of rice pudding. Even when the ash-clouds thinned and the sun returned, bringing new growth to the scorched earth, humanity was still beset by famines, pestilence and other types of unpleasantness. Vast upheavals and rearrangements of the Earth's surface were underway. Whether these were due to the lingering effects of the mighty weapons which the Ancients had used in their war, or were merely a natural process, we cannot know. In Africa, however, where the plague-bombs and orbit-to-earth atomics had not fallen so thickly, a certain amount of learning had been preserved, and it was here that the first flowers of civilisation began to bloom afresh. The so-called 'Spring Cultures' of Zagwa, Ogbomosho and the Tibesti Caliphate eventually grew into great trading cultures whose merchants and missionaries helped to restore civilisation to the rest of the world. As millennium followed millennium new societies arose in Europe and South America, as well as in the remnants of India and China and among the Thousand Islands of the Pacific. Some fell by the wayside, and we know little of them now beyond their names - the Raffia Hat civilisation, the Ash Boundary Culture, the Slate Bowl People. Others, like the great culture of Shan Guo and the Mountain Kingdoms, have endured into modern times. In none of these new societies did anyone attempt to match the technological achievements of the Ancients. Most, indeed, prohibited science and the building of complex machines, which they blamed for the disaster of the Sixty Minute War. Some, such as the Zagwans, persecuted anyone who tried to preserve scientific knowledge, and destroyed whatever vestiges of the Ancient World they could find. We can only guess at the loss to historians which such vandalism has caused! In the northern part of Europe, however, certain remnants of the old world were revered, as we can see in those so-called machine-shrines where, in the depths of the Black Centuries, people prayed and made sacrifices to the battered computer-brains, toasters and automatic drinks dispensers they had found among the rubble of Ancient settlements. Slowly, cultures arose which did not just worship the old machines, but tried to make them work again. The Blue Metal Culture, the Electric Empire with their earthenware batteries and strange electro-magnetic helixes, and the mysterious Pyramid Builders of the High Arctic were among them, but all were eventually swept away by natural disasters (the frequent Ice Ages of the period 10,000 to 3,000 BT), or by the rise of the Nomad Empires, rowdy hordes of barbarians who used whatever technologies they could find or steal in their endless wars with one another. They built armies of 'Stalkers' or 'Resurrected Men', and their mobile battle-platforms and 'traction fortresses' have been seen as the fore-runners of the Traction Cities we live upon today. One of these Nomad Empires was the Scriven, a mutant race from the high north, famous for their speckled skin and spectacular cruelty. As their numbers dwindled and the climate grew cooler they were gradually driven south and east out of their old strongholds in Siberia and found their way at last to London, a squalid trading-post in eastern UK. They conquered it easily, and ruled it for almost two hundred years. They were eccentric and tyrannical, yet under their rule London began to thrive again. Merchants and scholars were drawn to the city by the relics from the Ancient world which scavengers dug up in great quantities from the soil around it, and vast advances in knowledge and technological prowess were made. The Scriven even set up the Order of Engineers, a fore-runner of our present-day Guild of Engineers, to study and re-use the things they found. But the Scriven line was growing weak, and eventually, they were overthrown in their turn during a bloody rebellion led by the self-styled 'Skinners Guilds'. There then followed a brief period of independence for the city, before new nomad conquerors swept in from the north. These new arrivals called themselves the Movement, and their arrival marks the beginning of a new age; the Traction Era. For they were led by the genius who would transform our city, the immortal First Helmsman Nikolas Quirke. When the notion of Traction Cities first came to him, none now can say. Some legends that as a young man travelling aboard his nomad Traction Fortress he was visited by a dream in which he saw an entire city moving across the face of the earth. Others claim that the idea had first been conceived by the last of London's Scriven rulers, Auric Godshawk, and that Quirke merely inherited it, but few people nowadays believe that. Whatever the origin of the plan, Londoners soon came to see its wisdom - especially when it was pointed out to them that a mobile London need not just flee its enemies; it could conquer them, and use their raw materials to make itself larger, stronger and faster-moving! Over the following few years the city was torn down and rebuilt in the form of a gigantic vehicle, based on the linked and extended chassis of the Movement's Traction Fortresses. These were dangerous times, for while all Quirke's energy and resources were employed in the rebuilding of the city his nomad rivals in the north hatched plots and alliances to overthrow him and take the city's riches for their own. The most serious of these crises was the Northern War, in which many rival bands of nomads joined together and drove south to attack London with Stalkers, armoured mammoths and their own traction fortresses. But Quirke's genius defeated and obliterated them, and London moved north to devour their former strongholds. Today's Londoners would scarcely recognise the city on which their ancestors first set forth. Far smaller than modern London, it rolled on wheels instead of tracks, it had no jaws yet, and its three tiers were protected with armour and ringed with cannon and catapults. 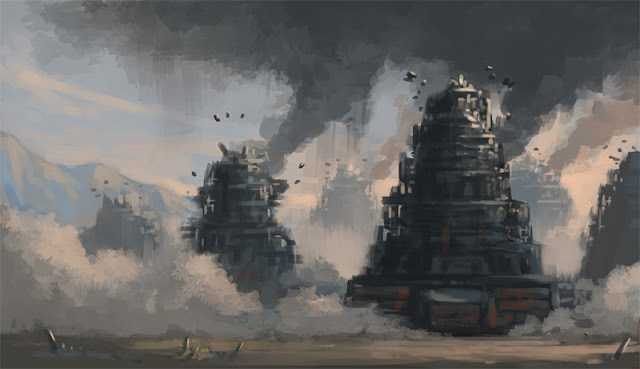 It looked more like a giant-sized version of the nomads traction fortresses than a city. But in the hundred years that followed it was to eat most of the richer settlements in UK, and the raw materials it took from them were used to expand the base-plate, construct the first tracks and add a further four tiers were added to the city, bringing the total to the seven on which Londoners live today. Also at this time we see the beginnings of the Guild system, with the groups responsible for each aspect of London's movements clubbing together to protect their own interests and educate their children in their own fields of expertise. All the Guilds met together in council to decide on the city's future course and likely meals. The Navigators who were responsible for steering it, and the Merchants who helped fund it quickly came to dominate the council. Historians, while lacking political power, were greatly respected, for they had already begun to create the London Museum, one of the greatest centres of learning about the past since the fall of the Ancient world, and the means by which many Old-Tech devices have been rediscovered, and restored to every day use. (It is interesting to note that London's engineers had very little power at that time. Despite the fact that it was their skills which kept London moving, they were divided into small groups; the Designers, Axle-Strengtheners, Wheelwrights, Cog-Cutters, Power-Teams, Duct-Managers etc, etc. It would still be several more centuries before they achieved the dominion over London affairs which they presently enjoy. As London increased its size and speed, and started to look hungrily at larger settlements on the far side of the old North Sea, other cities began to copy its lead, either in order to escape London's jaws, or in the hope of emulating its success. At first Londoners were indignant at what they saw as this poaching of their great idea. But Quirke-ite thinkers it thus. The Great Quirke, they said, has brought about a new phase of history. From this time on all civilised people will wish to live aboard towns which move. Those that are strong and swift will eat up those which are slow and weak. And in this way the affairs of men will come into harmony with the natural world, where the fittest survive. The theories of the Ancient philosopher Chas Darwin had recently been re-discovered in the library of one of the towns London had eaten, and the new system was quickly labelled Municipal Darwinism. There then followed the period known to vulgar people as the 'Traction Boom', during which cities and settlements of every size were compelled to 'go mobile', or to face being eaten up by others which had. Some added tracks like London's, other experimented with inflatable wheels, systems of rails, or even, in the case of the short-lived Pogo-city of Borsanski Novi, some large springs. Others, meanwhile, rebuilt themselves as rafts and took to the seas. Some, like Airhaven and Kipperhawk, became airborne, taking advantage of developments in aviation. Even the mountains can now be gnawed asunder by specialised mining towns in search of ore. Even the icy polar wastes are traversed by cities, and the floors of the oceans have become the hunting grounds of submarine towns like Pacifica. Can it be long before Airhaven is joined in the sky by hunting cities, perhaps ones capable of ascending to the very fringes of space? The Ancients, as anyone who has looked up at the night sky will know, built homes and observatories in orbit. It is not inconceivable that cities may one day evolve to hunt there, too. Like life, our cities adapt to exploit every environment. As Municipal Darwinism spread, the static cultures soon began to wither away. Today they survive only in mountainous regions, such as Shan Guo, where the warrior-monk Batmunkh founded his Anti-Traction League. In Africa the degraded remnants of the Spring Cultures still protect their heartlands against mobile towns, but even with the League's help their territories grow smaller every year. Despite such League atrocities as the sinking of Marseilles, most people believe firmly that moving cities are the future, and that Municipal Darwinism will triumph. Indeed, most city people nowadays imagine that it is barbarous and even unhealthy to set foot upon the bare earth. In years to come, the only thing left of the old way of life will be a few precious relics, preserved in places like our London Museum. This was a wonderful early essay written by Philip Reeve which gives a bit of further insight into the world of Mortal Engines. It is written from the point of view of Chudleigh Pomery, a character from the first Mortal Engines novel. It's probably not considered canon but serves as a fair idea of how giant traction cities came to roam the globe! Pomery is played by veteran British actor Colin Salmon. If you want to learn more about the stories that happened during the times the essay refers, check out Reeve's prequel series which starts with the novel Fever Crumb. This work used to be on Reeve's own site but was found at The Way Back Machine. All rights, Mr P Reeve.